Step 1: Thread your needle with 3 yards of Fireline. 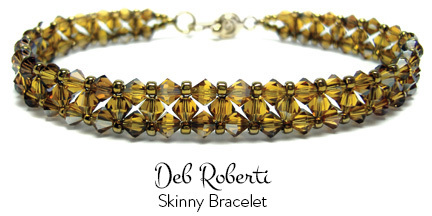 Now you’ll add a row of seed beads in between each bicone crystal along the top of your bracelet. Now you’ll add a row of seed beads in between each bicone crystal along the bottom side. Step 17: To attach one end of the clasp, string a bicone crystal and three seed beads. 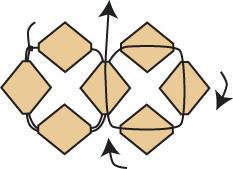 Weave back into the bracelet, knot in several places and cut your thread. Step 22: To attach the clasp to the other side of the bracelet, thread your needle with the tail from Step 1. Repeat Step 17 to Step 21.